Welcome to Shere C of E Infant School! Shere School is a small village school set in the heart of the Shere village and has been serving the community continuously since 1852. 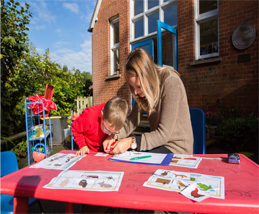 At Shere School we aim to ensure that the children in our care enjoy a happy, rewarding and exciting education, enabling them to truly fulfil their potential. We understand that each child is an individual and strive to ensure that we deliver a curriculum that fits the child whilst, at all times, aiming for the highest possible standards of achievement. In this way children’s strengths are celebrated and extended whilst their areas for development are carefully targeted and developed. We pride ourselves in working within a ‘learning environment’ which encourages and nurtures the best from all its members, staff and pupils alike. Consequently, we benefit from a highly qualified staff and a beneficent staff–pupil ratio. We believe that each child needs to feel part of a community in which trust, mutual respect and responsibility are highly valued by all members – children, parents, staff and governors alike. We understand that children take on these standards of integrity and personal determination from examples and expectations that are made clear to them, both at home and within the school community. We are proud of our close links to the community and, in particular, our Working in Partnership with Parents Award. Governors and parents play an active part and we always warmly welcome new members.